This paper is based in part on a longer article, “Beyond the nationalist–internationalist polarisation in the protection of archaeological heritage: A response to Professor Merryman”, that was published in Art Antiquity and Law, vol. XIV, no. 3 (October 2009), pp. 237–274. We thank the editor of Art Antiquity and Law for permission to republish some of this material here. “Sublime” and “smuggled in for sure” were some of the thoughts that went through the mind of Thomas Hoving, then Director of the Metropolitan Museum of Art in New York, when he first set his eyes on this Krater by Euphronios (Figure 1) — as he himself recounts the story in his autobiography and other writings (Hoving, 1993: 312; 2010). Fig. 1: The Euphronios Krater. Despite serious doubts about the Krater’s provenance, the Metropolitan Museum decided to acquire the vase in 1972, for one million dollars, at the time a staggering amount of money for an antiquity, from an American art dealer based in Rome. The acquisition was closely scrutinized in the press and openly condemned in some quarters. 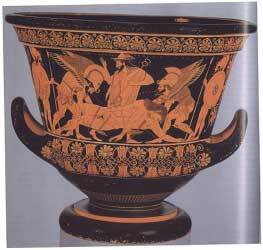 Nevertheless, the Euphronios Krater remained one of the crowning glories of the Met’s collection for over 30 years. But in 1992, the special branch of the Italian Carabinieri dedicated to the protection of the country’s cultural patrimony opened a criminal investigation against Giacomo Medici, a notorious antiquities dealer, after a series of raids at his home in Italy and at a large warehouse he kept in the Geneva freeport revealed compelling evidence of a massive smuggling operation of antiquities from Italy and elsewhere. Medici himself was put on trial and convicted, but the investigation ended up implicating a number of major American museums and collectors as likely buyers of illegally excavated Italian antiquities, including the Met, the Getty Museum in Los Angeles, the Cleveland Museum, the Princeton University Art Museum and the prominent New York collectors Leon Levy and Shelby White. After lengthy negotiations between them and the Italian government, a number of antiquities thought to have been illegally exported from Italy over the past decades were returned to the Italian state. In addition, two prominent figures in the art world, Marion True, chief curator of Greek and Roman antiquities at the Getty Museum, and Robert Hecht, the prolific antiquities dealer who had sold the Euphronios Krater to the Met, are now facing criminal charges at a high-profile trial in Rome. Among the recovered objects was the Euphronios Krater. The Italian investigation established that, in all likelihood, the Krater had been illicitly excavated in the area of Greppe Sant’Angelo, near Cerveteri, in December 1971 by a gang of tombaroli. The vase, together with 68 other recovered antiquities, was triumphantly displayed at a widely acclaimed exhibition at the Palazzo del Quirinale in Rome in 2008. The suggestive title of the exhibition was Nostoi: Capolavori Ritrovati — an obvious allusion to the homecoming journeys of the Greek heroes from the Trojan war. Italy is not, in fact, the only country seeking restitution of its illegally excavated or illegally exported antiquities. Greece, Turkey, Peru and several other countries have made highly publicized claims in recent years, mostly against museums and collectors in the United States. However, at this point, one may begin to wonder whether we are actually making a mistake by framing the debate about how best to protect the world’s archaeological heritage around the narrow legal concepts of “property” and “ownership”. Perhaps, by conceiving more broadly the different types of protection that archaeological resources can receive — and the different actors who might be authorized to make decisions about that protection — we might make more progress on the problem. Incidentally, it is worth remembering that the concept of cultural “property” is a peculiarly English terminology. In Italian, we usually talk of “beni” culturali, just as in French we say “biens” culturels. Furthermore, it is often difficult to attribute “ownership” to one particular country. Modern state borders rarely coincide with those of ancient civilizations. In addition, because of trade within the ancient world, objects may be found in archaeological sites far from the place where they had been originally produced. In purely conceptual terms, why should an Attic vase found in an Etruscan tomb at Cerveteri or Vulci be considered the “property” of Italy rather than, say, Greece? Or, for that matter, shouldn’t we consider cultural heritage as belonging to humanity as a whole? There are, in fact, huge legal and ethical questions involved and making the right decision is not always easy or clear-cut. miscasting the controversy as a dichotomy between “nationalist” and “internationalist” approaches in which “nationalist” is assumed to be a synonym for “anti-market” and “internationalist” for “pro-market”. I shall argue that this conflation is improper: internationalists can perfectly well oppose the private collecting of antiquities, just as nationalists can support it. failing to stress the crucial difference between museums and public institutions on the one hand and private collectors on the other. failing to take proper account of the differences between antiquities and other classes of art. indiscriminately using the word “market” to denote very different types of transaction, between different types of buyers and sellers. eliding the fundamental differences between export control laws and national patrimony laws. The key issue, I will argue, is not whether all archaeological material should necessarily be kept in its country of origin; it is how best to safeguard archaeological sites from looting and pillage. I shall therefore defend a moderate internationalism that opposes all private ownership of antiquities while encouraging the international circulation of art and antiquities among public institutions. The ultimate goal is to move beyond the nationalist vs. internationalist polarization and to devise means to protect the world cultural heritage while making it available to citizens of all countries. It is useful to start by being clear about what the problem is. Of course, as we archaeologists well know — but the general public and politicians often do not appreciate — the purpose of archaeology is not just to recover pretty objects from the ground; it is to reconstruct the history of the human past. Indeed, some of the most useful information for archaeologists comes from items that have no monetary or aesthetic value at all: pottery shards, pieces of charcoal, human and animal bones, even seeds and pollen. All the information that could be obtained by scientific excavation is irreparably destroyed every time an archaeological site is plundered. At best we are left with a few objects, beautiful as they may be, but silent. In the past two decades, the looting of the human past has become a large-scale industry. Archaeological sites around the world are being stripped clean to feed the world market in antiquities. As journalist Roger Atwood documents in his recent book Stealing History, looters are well-organized and increasingly well-informed about the tastes of collectors in rich countries (Atwood, 2004).The pillage of archaeological sites, no less than the drug trade, is driven by demand from the market. Now, the debate between “nationalist” and “internationalist” approaches to cultural heritage can be summarized briefly as follows: “nationalists” tend to stress the rights of the country of origin in safeguarding cultural property, including the right to prohibit export, while “internationalists” tend to stress the claims of humanity as a whole and to seek a wide circulation of cultural objects. Of course, many intermediate positions are also possible. In fact, international agreements for the protection of cultural heritage have always reflected a mix of “nationalist” and “internationalist” goals. For instance, the 1954 Hague Convention for the protection of cultural property in time of war advocates the protection of cultural heritage for the benefit of all mankind, but it also aims at protecting the cultural heritage of individual nations. Indeed, the Hague Convention was inspired in part by the abuses committed during previous wars, in which belligerents had employed the theft or destruction of their enemies’ cultural heritage as a political weapon. For instance, in Article 4(3) of the Convention we read: “the Contracting Parties further undertake to prohibit, prevent and, if necessary, put a stop to any form of theft, pillage or misappropriation of, and any act of vandalism directed against, cultural property. They shall refrain from requisitioning movable cultural property situated in the territory of another Contracting Party”. And Article I.3 of the first Protocol to the Convention requires that all cultural property be returned to previously occupied countries at the close of hostilities. Equally, the 1970 UNESCO Convention on the illicit trade in antiquities, while seen by many as leaning more in the “nationalist” direction — which is not surprising for a product of the post-colonial era — still clearly recognizes that “the interchange of cultural property among nations for scientific, cultural and educational purposes increases the knowledge of the civilization of Man, enriches the cultural life of all peoples and inspires mutual respect and appreciation among nations”. When all is said and done, the heritage of any human culture belongs both to that culture’s descendants and to humanity as a whole. It follows that both “nationalist” and “internationalist” concerns are relevant and deserve to be accommodated in cultural-heritage policy. The need for preservation and access leads me to my second point, namely, the distinction between private collectors on the one hand and museums and other public institutions on the other. In my view, private collecting, by definition, does not serve the interest of the general public. Museums’ role, by contrast, is principally to educate the public and to serve as repositories of our shared historic and artistic patrimony. In this perspective, museums are the most natural and fitting institutions to serve the internationalist ideal. Ultimately, it isn’t really relevant whether a find from Pompei (especially if it is a duplicate) ends up in a museum in Naples, Italy or in Naples, Florida, as long as the integrity of its context is maintained and the object is kept in the public domain. Accessibility is indeed a key issue. Both scholars and lay people in different parts of the world should be given the opportunity to enjoy and share the knowledge of “the common cultural heritage of mankind”. Also, archaeological materials, possibly more than any other historical documents, often need to be re-examined and reevaluated, for instance in the light of new dating techniques being developed, or for comparative or quantitative studies when new materials are discovered in the course of more recent excavations. Guaranteeing adequate access to private collections would be very difficult, if not impossible; indeed, in many countries it would require radical changes in the laws regulating private property. Bearing this in mind, museums have the responsibility to lead the way in setting the ethical standards in the art world. They should all adopt strict codes of ethics and careful acquisition policies, and where these are already in place, commit themselves to strengthen the often-too-vague guidelines and observe them consistently. Shockingly, however, an important study published in 2000 by British archaeologists Christopher Chippindale and David Gill found that up to 75 percent of antiquities in a sample of major private and museum collections have no documented provenance (Chippendale and Gill, 2000). Part of the problem is that public funding is very often inadequate, especially in the United States, so that many museums are highly dependent on private sponsorship, much of which comes from collectors. This often creates inevitable, and in many cases detrimental, alliances. For instance, museum curators sometimes advise collectors on purchases — even of unprovenanced material — with an eye toward possible future acquisitions of private collections on behalf of the museum, by either purchase or bequest. Occasionally museum curators feel pressured to display objects loaned by wealthy patrons, or even accept them as donations — despite the absence of verifiable provenance — in order to avoid alienating a potential major funder. My third point concerns the fundamental differences between antiquities and other types of art, such as Old Master paintings, modern art, or art by living artists. Of course, all art by non-living artists is a non-renewable resource; but for no other kind of artwork is context so important as for antiquities. The historic (as opposed to merely aesthetic) value of any ancient artifact resides principally in its relation to its original context. Whenever the stratigraphic order of the archaeological layers or the exact position of various finds are disturbed, all sorts of analysis become impossible: for instance, accurate dating, precise spatial distribution, and many types of statistical and quantitative studies. By contrast, many of the examples used by supporters of a freer market — who complain in particular about export control laws — concern art of the last few hundred years, not antiquities. Suppose, for instance, that the national museum of Mali has some duplicate Djenne-jeno terracotta objects or Bankoni-style statues that it is willing to offer to a museum in another country: are loan and exchange the only legitimate options? Perhaps a museum in Kansas would like to enlarge its collection of ancient African art but has no duplicate objects of interest to the Mali museum; and perhaps, conversely, a museum in Greece has artifacts of interest to Mali, but no desire to build a collection of African antiquities. Shouldn’t the Mali museum be permitted to sell its duplicate artifacts to the museum in Kansas and then to buy pieces from the museum in Greece? Or for that matter, to use the money to sponsor new excavations, to renovate the museum facilities, or to improve staff salaries? Indeed, doesn’t the Malian government have the right to decide that the proceeds from the sale of duplicate antiquities are more urgently needed by the Health Ministry than by the museum? Nor is the problem limited to museums in the developing world. Museum storerooms in Italy, Greece and many other art-rich countries are overflowing with ancient artifacts that, in some cases, have not yet been catalogued or studied, for lack of personnel and funds. Even the 1976 UNESCO Recommendation Concerning the International Exchange of Cultural Property concedes, in its preamble, that “many cultural institutions, whatever their financial resources, possess several identical or similar specimens of cultural objects of indisputable quality and origin which are amply documented, and . . . some of these items . . . would be welcomed as valuable accessions by institutions in other countries” (UNESCO, 1976). Might it not be sensible then, for a museum in Colorado, wishing to build an antiquities collection, to help finance the cataloguing of that material, and in return to get some of those objects as either outright purchase or long-term loan, once the cataloguing is finished? “International exchange” shall be taken to mean any transfer of ownership, use or custody of cultural property between States or cultural institutions in different countries — whether it takes the form of the loan, deposit, sale or donation of such property. But none of this provides any reason to support a private market in antiquities, or private collecting, as many supporters of a freer market would like. Indeed, the main arguments usually put forward in favor of the private market are both brief and lame: for instance, John Henry Merryman, a law professor at Stanford University and a leading champion of the antiquities trade, echoing the sentiments of many others, lauds what he calls “the historic roles of collectors and dealers in supporting artists and promoting their work; in building private collections that ultimately enrich museums; and in pioneering the collection of objects that eventually are recognized for their cultural importance” (Merryman, 2005: 24). The first argument is irrelevant to antiquities. As for the second, we have already seen that many objects in private collections have no provenance, thus vastly reducing their scholarly value; also, private collections reflect the interests and tastes of their owner, which may or may not correspond to museum curators’ judgment of the public interest. Moreover, as noted before, museums’ reliance on donations from collectors can create undesirable situations of dependency. As for Merryman’s third argument, collectors may on occasion be scholarly pioneers, but collecting can also be detrimental to scholarship by fuelling looting of newly discovered or newly popular categories of materials and by stimulating the production and dissemination of fakes. This has been the case, for instance, of Cycladic sculptures and Malian terracottas. Nevertheless, one might ask: If it is legitimate for a museum to sell its duplicate objects to another museum, once they have been catalogued and studied, mightn’t it also be legitimate to sell some of its minor pieces — say, Roman oil lamps, which exist in the tens of thousands — to private collectors? Mightn’t there be some limited scope for private collecting, and a licit private market, in antiquities that have been scientifically excavated and catalogued but are no longer needed in museums? My answer to all these questions is a resounding “no”! It simply would not work. I very much doubt that private collectors, especially the richest ones, would be satisfied with minor or recycled objects. Mid-market antiquities are not likely to be a substitute for up-market demand. There would always be demand for new and important pieces. After all, most countries already have laws regulating the licit market and criminalizing unauthorized excavations; yet looting still continues on a large scale. As long as there exists a private market in archaeological artifacts, there will be an incentive for looting and plunder. Two other areas of acrimonious contention between the pro-and anti-market camps are national patrimony laws and export control laws. As many of you know, national patrimony laws vest title to all undiscovered antiquities in the State, while export control laws are meant to restrict the exportation of “national treasures” and other works of art. What is important is that patrimony laws and export control laws have radically different effects in foreign jurisdictions. Foreign courts will ordinarily refuse to enforce other countries’ export control laws, whereas foreign courts will usually apply other countries’ patrimony laws where relevant in determining title. The arguments in favor of national patrimony laws are compelling. Nearly all archaeologically rich nations of course have laws forbidding unlicensed excavation (even on privately owned land) and punishing offenders with fines or prison terms. But a national patrimony statute strengthens the deterrent against clandestine excavation by allowing it to be punishable as theft and by providing a legal basis for the recovery of illegally excavated objects, even in foreign jurisdictions. Above all, national patrimony laws reduce the marketability of illegally excavated antiquities — at least among “respectable” dealers — by casting doubt on the seller’s title and raising fears of lawsuits by the State of origin. Indeed, by establishing a presumption that undocumented antiquities are stolen property — provided (and this is a big if) they can be proven to have been unearthed within the national territory after the effective date of the statute (the burden of proof here of course rests with the State) — patrimony laws greatly help to constrict the market for looted antiquities. What, then, are the attitudes of the supporters of free-trade towards export control laws and national patrimony laws? Regarding export control laws, their position is clear: while approving of export controls in limited situations, they usually denounce the abuses of export control by art-rich nations. Some of these criticisms are indeed well-taken. For instance, in several of his articles Merryman recounts the story of a Poussin painting that was sold by its French owner (a private collector) to the Cleveland Museum without the required export license (Merryman, 1988: 482-486; 1994: 65-66; 1995: 21-22; 2000). As Merryman rightly comments, it is hard to see what damage would be done to the French national patrimony by the export of a single painting out of a large corpus, or why the painting would be less well cared for in an American museum than in a French private collection. Indeed, it may seem quite reasonable that the painting would serve a far greater public interest in a museum than in a private home. However, some commentators, like Lyndel Prott, contend that it should still be the right of France to make such decisions regarding its own cultural patrimony (Prott, 2005: 233). There is some merit in this position, although getting into detail about this would require a whole other paper. Merryman and others also criticize national patrimony laws for a variety of reasons, among other things because they are difficult to enforce: both because violations occur clandestinely and because citizens and even local police frequently consider such laws to be illegitimate encroachments on people’s right to earn a living (Merryman, 1995: 34-35). But the difficulty of enforcement is not per se an argument against a law: after all, the laws against tax evasion and child abuse are also difficult to enforce, but no one advocates repealing them. Nor is public skepticism towards the legitimacy of a law necessarily an argument against it: rather, in our case it may simply indicate the need for a greater public awareness of the importance of context in archaeology and of the damage done by illicit excavation. Critics of patrimony laws are, however, right about the problem of chance finds during building works or road construction. In most antiquities-rich countries such as Greece, Italy, Egypt and Mexico, this is indeed a common hazard for landowners and developers. By law they are obligated to report any antiquities they come across, in order that the area can be scientifically excavated, if appropriate, by professional archaeologists. Often this process takes a long time and there is little or no financial compensation provided for the people affected. Of course this is a regrettable situation that should be addressed by a more efficient system for assessing the archaeological importance of a site and, in cases where the site is deemed important, with an adequate scheme of just compensation for losses incurred (as well as possibly a modest finder’s reward). In any case, a licit market in antiquities would do nothing to help prevent these kinds of situations from happening. It is, in the end, a shame that the supporters of the antiquities trade such as Professor Merryman have chosen to raise the banner of “cultural property internationalism” in order to legitimate the private collecting of antiquities: first of all, because there is simply no logical connection between the one and the other; and secondly, because internationalism has much to be said for it, once it has been disconnected from the false link to private commerce. Indeed, as mentioned earlier, the position being defended here is a moderate internationalism. But internationalism need not be a one-way street: true internationalism is the idea that the cultural creations of all humanity should be shared and enjoyed as widely as possible. In particular, the inhabitants of poor countries should have access not only to their own cultural heritage but to world culture in all its variety. Merryman graciously concedes that part of internationalism is that “the inhabitants of every nation, including the poorest survivors of colonial exploitation, [should] have access to a fully representative collection of objects that represent their history and culture” (Merryman, 2005: p.13, the italics are mine). This is the least one should expect! It is telling that Merryman, despite his professed internationalism, makes no reference to the idea that inhabitants of poor countries might want or deserve access to objects from other cultures and not just their own. One way of achieving this could be for museums and cultural institutions in rich nations to lend objects from their own collections to museums in poorer countries. For instance, the Metropolitan Museum of Art in New York could lend some of the artifacts from its extensive collections of Greek, Roman or Chinese art — much of which sits in storerooms — to a museum in Mali or Bolivia. If such traveling exhibitions were to become widespread, poorer source nations might feel more willing to relax some of their export restrictions. Of course, cost is a problem, and for such a scheme to work, the wealthier museums would need to underwrite the transportation and insurance expenses. But, from an internationalist point of view, this seems a small price to pay for institutions whose role is, after all, to serve and educate the public and which like to call themselves “universal”. In an ideal world, the best development would be the complete disappearance of a private market in archaeological artifacts; but this is probably a utopian vision or, more optimistically, a distant possibility. A more realistic goal would be national and international legislation demanding that each object have a documented provenance back to a specified cutoff date, and making the rebuttable presumption that objects without such documentation are illicit. However, we are at present still far from getting this kind of legislation in any of the major art-importing countries. It is therefore urgent to consider, simultaneously, measures that would reduce the total global demand for purchase of antiquities: first, by greatly reducing the appeal of private collecting, through campaigns aimed at raising public awareness about the problem of pillage; and second, by giving museums and educational institutions wider access to antiquities through means other than purchase on the private market. Among these, as I have mentioned, are long-term loans, widely travelling exhibitions, strictly controlled museum-to-museum sales or exchanges of duplicate objects, and joint excavation projects with art-rich countries (in which some of the finds could be loaned to the foreign contributing institutions). Moreover, having eliminated the competitiveness of the open market which drives up prices, some of the vast resources currently invested by major museums in the purchase of antiquities could be effectively channeled instead into sponsoring new research and excavations, conservation projects, educational and training programs for local populations in art-rich regions, construction of on-site museums, and the development of responsible cultural tourism — all in order to help create, at least in part, a sustainable economy and real expertise for local peoples out of their cultural resources, while preserving their historical heritage. To conclude, it seems to me that the long-term task for all of us must be to sensitize both citizens and politicians to the immense loss to our historical patrimony that is being caused by the illicit trade in antiquities. With such an awareness, it should be possible to devise effective measures to protect the world’s cultural heritage, and to make that heritage widely available to people around the world in a safe and democratic way. Appiah, K A 2006 Whose culture is it?, New York Review of Books, 53(2). Atwood, R 2004 Stealing History: Tomb Raiders, Smugglers, and the Looting of the Ancient World. New York: St. Martin’s Press. Chippindale, C and D W J Gill 2000 Material consequences of contemporary Classical collecting, American Journal of Archaeology 104(3): 463–512, http://www.jstor.org/stable/507226. Elia, R 2001 Analysis of the looting, selling and collecting of Apulian red-figure vases: A quantitative approach. In: N Brodie, J Doole and C Renfrew (eds. ), Trade in Illicit Antiquities: The Destruction of the World’s Archaeological Heritage. Cambridge: McDonald Institute for Archaeological Research. Hoving, T 1993 Making the Mummies Dance: Inside the Metropolitan Museum of Art. New York: Simon & Schuster. Hoving, T 2010 “Super Art Gems of New York City” http://www.artnet.com/Magazine/FEATURES/hoving/hoving6-29-01.asp (accessed 10 February 2010). Mead, R 2007 Den of antiquity, The New Yorker 83(7): 54–61. Merryman, J H 1988 The retention of cultural property, U.C. Davis Law Review 21: 477-513. Merryman, J H 1994 The nation and the object, International Journal of Cultural Property 3: 61–76, doi: 10.1017/S094073919400007X. Merryman, J H 1995 A licit international trade in cultural objects, International Journal of Cultural Property 4: 13–60, doi:10.1017/S094073919500004X. Merryman, J H 2000 Thinking About the Elgin Marbles: Critical Essays on Cultural Property, Art and Law London: Kluwer Law International. Merryman, J H 2005 Cultural property internationalism, International Journal of Cultural Property 12: 11–39, doi:10.1017/S0940739105050046. Prott, L V 2005 The international movement of cultural objects, International Journal of Cultural Property 12: 225–248, doi:10.1017/S0940739105050125. UNESCO 1976 Recommendation Concerning the International Exchange of Cultural Property, 26 November 1976. Available online at www.unesco.org.